In the winter of 330-329 BC Athens itself suffers a series of alarming thefts and home robberies. It seems that nobody is safe. The great philosopher Aristotle helps his former student Stephanos investigate a break- in and brutal murder at the house of one of his Athenian neighbours. The man fingered for the crime turns against Stephanos just as he is planning his marriage. It is difficult to arrange a big fat Greek wedding when someone seems to be trying to kill you. Elsewhere bodies begin to pile up--who will be bludgeoned or stabbed or strangled next? Stephanos' bride is Philomela. Her parental home is Eleusis, famous for the Sanctuary of Demeter and Persephone, home of the sacred site of the Mysteries of Eleusis. Religious initiation is open to all adult Greek speakers, slave and free, with the exception of anyone guilty of homicide. Stephanos, Philomela and Aristotle undertake mystic initiation in a complex ritual whose ultimate secrets cannot be spoken, on pain of death. Eleusis conceals many secrets, and revelation of the truth must await the night of the Mystery celebration itself. This is a historical mystery fiction set in ancient Greece and features who else but well know philosopher Aristotle. 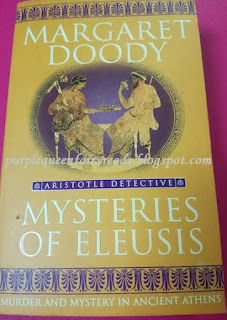 To me this reads a bit of Sherlock Homes mysteries in ancient Greece and if you enjoy SH, you might enjoy this but instead of Sherlock you get Aristotle and Sherlock and his former student Stephanos could probably pass as John Watson. It is quite interesting to have a glimpse of ancient Greece and although it's a fiction, I am sure culturally and socially, it would be quite an accurate interpretation and portray of society then. It was quite difficult for me to read as the names are difficult to remember and I quite confused as to who is who and hm...the men then seems to be pretty openly promiscuous and seems to be socially accepted to a certain extend.